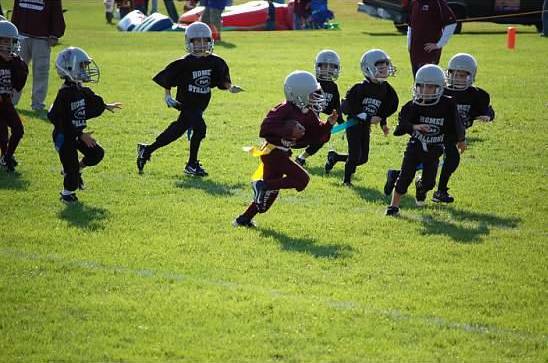 Our Flag program is for 5, 6 & 7 year old players generally no more than 70lbs. 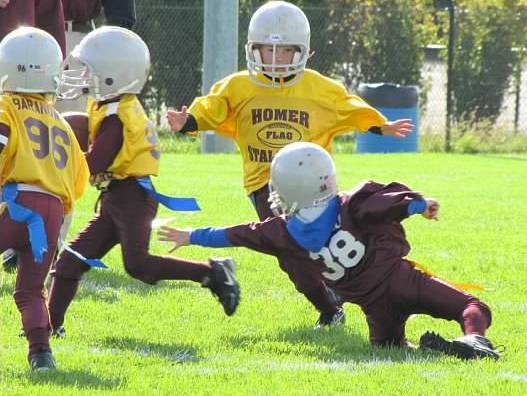 The goal of the program is to teach the fundamentals of football without a focus on tackling or heavy contact. Helmets are provided for protection and not as an inducement for contact. No score is kept in the games. 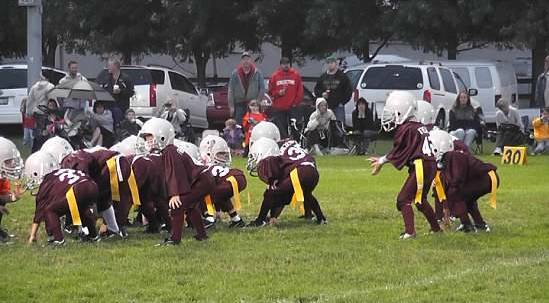 The fundamentals of teamwork, discipline and hard work toward a common goal are taught side by side basic football fundamentals including blocking, running, passing and catching as well as good defensive skills. We are an in-house program playing other Homer Stallion teams. We attempt to split our teams as equally as possible relative to age and experience and the coaches work to ensure each player has a great experience. We want them to develop a love for the game. All Flag Football teams will practice at the complex in the fields west of the equipment shed. Dates may be changed by the coaches to better meet the needs of the team. Equipment (helmets, mouthpieces, flags) will handed out at practice that first week. Practice is typically held at the fields west of the shed at the Homer Township Sports Complex from 5:45-7:15pm, 3 days per week, typically Mon, Tue and Wednesday until school starts and then will change to Tues. and Thurs. from 5:30-7 once school begins. However coaches have flexibility to adjust the practice schedule as best for each team and coaching staff. Games are played on Friday nights (7pm) and/or Saturday mornings (around 9am). 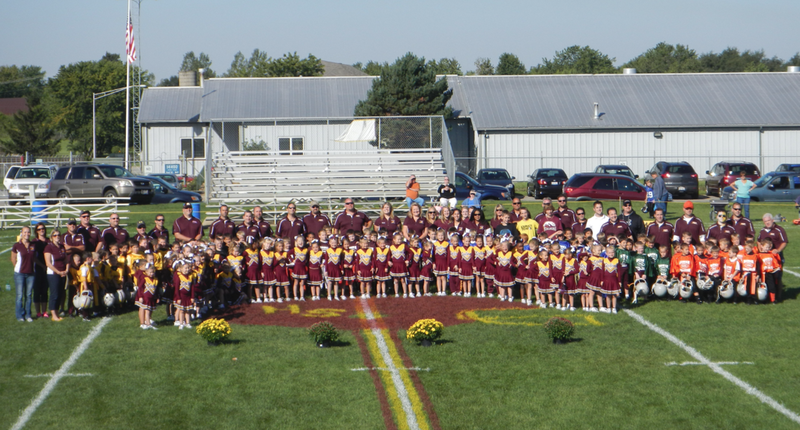 Typically when the tackle program is home, the Flag program plays that Saturday morning before the tackle games. When the program is away, Flag plays under the lights on Friday nights and we try to organize each game around a theme (Grandparents night, Hawaiian night, etc). Jerseys will be provided that they can keep after the season.